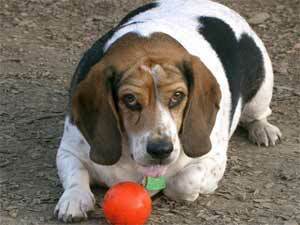 Canine Obesity: Tips to Get Your Dog Fit and Trim! There is sometimes a fine line between spoiling our much-loved family dog and actually contributing to their health problems if they become obese. Canine obesity is on the rise, and according to the PDSA, as many as 50% of our nation’s dogs could die early as a result of obesity. Obese dogs have a much higher likelihood of suffering from related medical conditions such as diabetes, arthritis, heart and lung disease, as well as putting an extra strain on their immune system and causing high blood pressure. The overriding message that needs to be considered here for all dog owners, is that a dog that manages to maintain an ideal body weight will, on average, live 15% longer than an overweight dog, and reduce their odds of suffering from diseases too. It can sometimes be difficult for a dog owner to accept or even believe that their canine friend is carrying as much as 20lb more than they should be, and the reason for this is primarily that because we have become rather immune to the sight of an overweight or fat dog, we seem not recognise this rather obvious visual warning sign. Different breeds have different traits and characteristics and in very general terms you would not expect to see a Greyhound carrying as much weight as a Labrador, but whatever breed of dog you have there is a relatively simple quick test that you could carry out to see if your dog is overweight or even obese. Run your hands along the side of your dog’s body all the way from the head to the tail and check if you can feel their ribs. You should be able to just feel the ribs in a dog that is carrying a healthy weight and once you have done this, take a look at your dog from the side. Most dogs should be able to achieve a relatively tucked-in profile, but if all you see and feel are some rolls of fat and their side profile is more rotund than sleek and slender, there is a good chance that they are carrying more weight than they should be. If you have any concerns about your pet’s weight then it would be a good idea to make an appointment with your vet and get a professional opinion and advice on their current and ideal body weight, so that you know what you have to do to get your dog back into good shape. Once they have assessed their current weight and general health, your vet should be able to advise how many calories should be consumed each day in order to reach an ideal body weight. Dogs can have a tendency to eat when they are bored rather than when they are actually hungry, which is not dissimilar to the way some of us tend to behave, either. The best way to tackle their eating routine is to avoid giving them free choice and making food constantly available. Instead, operate portion-control with properly measured portions provided at regular intervals of between two and four times per day. It is important to feed your dog in concurrence with their ideal bodyweight and not their current weight. Feeding them according to their current weight rather than their target weight will result in continued weight gains, so be sure to take this into consideration as part of your efforts to get your do back into shape. We are constantly being informed that processed food that has a high sugar content and contains artificial preservatives and flavourings is bad for us. You should apply the same and caution and logic when it comes to following a diet that meets their needs but heeds our current understanding of what is considered bad food. Feeding your dog the right level of nutrients and helping them to overcome or avoid allergies is not as complicated as it may seem. Dogs have the metabolism to cope with raw meat and bacteria which humans do not, but they also have their list of bad foods which are chocolates and raisins or grapes, all of which are highly toxic to their system. If you aim to take the same level of dietary care that you would for yourself and introduce healthier and fresh ingredients like lean meat and a selection of fruit and vegetables in their bowl, this will help them to be leaner and fitter. It will also be much more beneficial to their long-term weight and health than relying on processed canned food all the time. As we all know, diet is one way to get rid of those extra pounds but exercise is just as important if your dog is going to be able to return to their ideal bodyweight as efficiently and healthily as possible. Regular walks and exercise are a key part of keeping a dog fit, healthy and happy. There is a growing trend amongst some dog owners to regard a walk with their dog as a bit of a treat on a sunny Sunday afternoon. Even if a dog has access to a reasonably large garden, they are much more likely to develop sedentary tendencies unless they get the stimulation of regular exercise with their owner. Injury and obesity are definitely risk factors if the exercise is sporadic and features only occasional bursts of running. It is also a chance for the owner to enjoy some fresh air and get a bit of healthy exercise, so do try and work a daily walk with your dog into your timetable. There is also a growing trend in the use of canine hydrotherapy pools for getting overweight dogs back into shape and improving their overall heath profile. Hydrotherapy for dogs can be an ideal solution as swimming and exercising in a hydro pool designed for canine use offers the opportunity for non-load bearing exercise, which is particularly helpful for dogs who want to avoid strain being placed on injured or recovering joints and muscles, but need the exercise to control their weight. Many dogs derive a great deal of pleasure from their visit to the pool and ball exercises make it a fun activity that many enjoy, especially as even nervous dogs are catered for with flotation devices if they are unsure about the water at first. Canine obesity is a growing trend, so make sure that your dog does not become another statistic by employing a healthy eating and exercise routine. Jack Wilkes is a canine hydrotherapist with a passion for all animals. When not seeing patients or walking his own dogs, he enjoys writing about basic pet health concerns and training challenges. Connect with DoggySwim on Facebook or Google+.